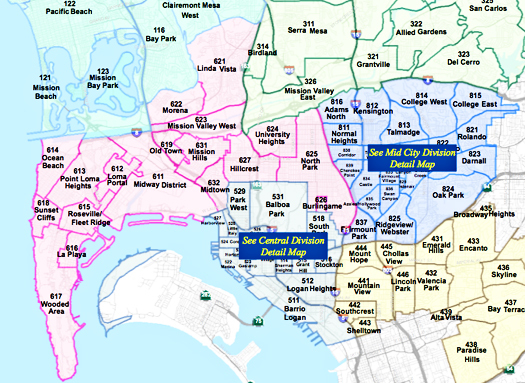 District boundaries across San Diego are being redrawn, that goes for the police department districts as well. On September 17, police districts will change. For residents of North Park that means they will no longer be included in the police department's Western Division. Instead, North Park will be part of the Mid-City Division. Tonight, July 28, residents of North Park are invited to a meeting of the North Park Action Team to discuss the changes to the police district. "According to police representatives, this should result in quicker response times and more available police time for the community," reads the summary for tonight's meeting. Currently, Western Division is among the busiest divisions in the department. The beat spans from North Park to the tip of Point Loma, going as far north as Linda Vista and as far south as South Park. Mid-City covers less area: City Heights, College Area, Chollas Creek, Rolando, and Oak Park. Acting captain of the Mid-City Division, Lt. Todd Jarvis, will explain the changes and what it means for North Park residents. The meeting will take place at the North Park Adult Community Center at 5:30pm. SurfPuppy619 July 28, 2011 @ 6:19 p.m.
North Park should have always been part of the Mid City PD station. JustWondering July 29, 2011 @ 8:37 a.m. Beat realignment by community is a subterfuge, not the real reason for this realignment. The real question that needs to be explored is the total number of patrol beats by command, compared to the previous beat maps. If the number of beats has been reduced, meaning new beats have been geographically enlarged, then it's all about smoke and mirrors and not public safety/response times. Why, you may ask? It's simple, with 200 fewer officers on the force than just a few years ago, to reach the minimum staffing requirements with fewer uniformed police officers, you need to reduce the number of beats. Since you cannot shrink the City, you enlarge the beat boundaries, and thereby increase response times with fewer available officers. Of course you do accomplish one thing, you can report you met your minimum staffing requirements each day, at least on paper. San Diegans are very lucky. We have an incredibly low crime rate for the 8th largest city in the nation. However, our population continues to grow as our police department shrinks. We have fewer officers today then we did just a few years ago. Let's hope the men and women who keep the public peace, not only keep us safe, we need them to stay safe too. By stretching a limited resource even more thinly than we already have, City leaders put us all in jeopardy. We've already seen the negative and life risking affects on fire department response times from the so called Brown-outs. We also seen how reported numbers are easily manipulated when the City wants a report to come out in a certain way. Now its the PD's turn in the public service hopper. Let's pray no one, citizen or cop get injured or killed over this latest decision.